.223 it's a tried and proven caliber world wide. Bullet selection is excellent. If you wanted it primarily for foxes, small game and almost all vermin a 1in12 twist is the perfect twist rate for 55grain bullets. If you decided you want a nice target and vermin rifle in one get a 1in8 twist 62-80grain bullets. 69grain bullets are a great all round bullet for distance and knock down power. 223 is very cost effective, very long barrel life, ammo is avalible in every corner of the earth, it will buck the wind for better than .20 cals and far cheaper to shoot than 22250 and 243. I have always had a 223 and always will. I Have had 22250 ,270 17hmr 22wmr still have a 243 308 etc etc but the 223 truley is one of the most versatile calibers avalible. No I agree but let's be real they say no we say yes big man wins every time. I picked up a tac last week it has the undercut thread so they must have adressed it from the factory but in my opinion gmk should recall and replace those that are not. The thing is it is a harder job to turn threads to the shoulder than under cut them with a parting tool at 1/8". Look at the USA they get them for 1500-1800 usd we pay 1700£ in the USA they got 2 mags supplied and a free one after registering for the warranty we get one here if you want to buy a second it's £120. I have a hornady manual 10th edition I can send you load data you looking for any load in particular? Sightron SIII 6-24x50 SFP / FFP / Mil-Hash / MOA for long range .223..? I have been looking into this for about 6 month now. I have my 223 with 1in8 twist heavy 24" barrel and I plan on doing targets out to 800 (Just for fun ) and long range rabbit and crow work 200-400 yards. Bullet selection is 69gr smk. As for the scope In my head metric calculation work quicker and easier. I have bought a delta Stryker 4.5-30x56 FFP it is very capable of out to 1000+ meters. It has 0.01mill clicks of adjustment that will give you 1cm at 100m and 10cm at 1000m and has a total of 30mill of elevation so no need for 20 moa rail etc. 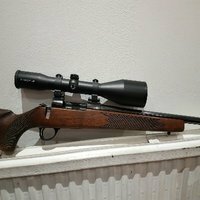 I had been looking at them for some time and got the chance to look through one at the shooting show as soon as I raised it to my eye that was it unbelivavble glass. Have you heard of ritchard utting? I like his honest reviews on stuff he reviews the product not the name on the side. Here is a link the delta Stryker starts at 22 mns.